The Knights of Columbus are not only active in the United States but also in a number of counties throughout the globe – including all of the North America counties. “The Knights were established in Mexico in 1905 and by the 1920s there was a revolution in Mexico, accompanied by widespread persecution of Catholics including martyrdom of many priests. The Knights have published a booklet entitled: KofC Martyrs of Mexico – to tell a brave and historic story. “Missionaries were expelled from the country, Catholic seminaries and schools were closed, and the Church was forbidden to own property. Priests and laymen were told to denounce Jesus and their faith in public; if they refused, they faced not just punishment but torture and death. 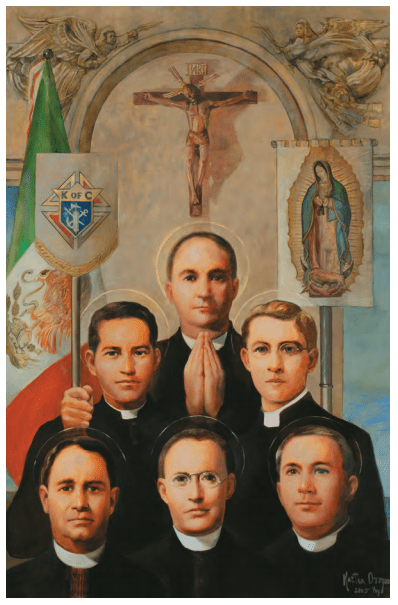 During this time of oppression and cruelty, the Knights of Columbus did not retreat in Mexico but grew dramatically, from 400 members in 1918 to 43 councils and 6,000 members just five years later. In the United States at the time, the Knights handed out five million pamphlets that described the brutality of the Mexican government toward Catholics. As a result, the Mexican government greatly feared and eventually outlawed the Order. Thousands of men, many of whom were Knights, would not bow to these threats or renounce their faith, and they often paid with their lives. They took a stand when that was the most difficult thing they could do, and their courage and devotion have echoed down through the decades. Mexican Knights, and the entire Church in Mexico, were consistently supported by the Knights in the United States who, in addition to distributing literature that informed the American people of the plight of the Church in Mexico, also lobbied President Calvin Coolidge to bring pressure to end the persecution. In 1926, Coolidge met with a delegation of Knights including Supreme Knight James Flaherty, future Supreme Knight Luke Hart and Supreme Director William Prout. Coolidge affirmed his administration’s commitment to bringing about a resolution to the problems in Mexico. You can find the link to the entire booklet, previewed above, at www.IWKnights.com (click on “Bulletin Inserts” at the top of the page) and our Facebook page at facebook.com/IWknights9981.